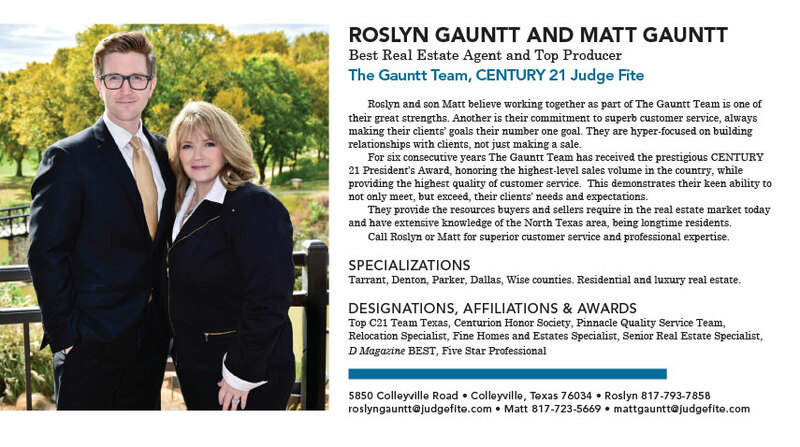 Roslyn and son Matt believe working together as part of The Gauntt Team is one of their great strengths. Another is their commitment to superb customer service, always making their clients’ goals their number one goal. They are hyper-focused on building relationships with clients, not just making a sale. For six consecutive years The Gauntt Team has received the prestigious CENTURY 21 President’s Award, honoring the highest-level sales volume in the country, while providing the highest quality of customer service. This demonstrates their keen ability to not only meet, but exceed, their clients’ needs and expectations. They provide the resources buyers and sellers require in the real estate market today and have extensive knowledge of the North Texas area, being longtime residents. Call Roslyn or Matt for superior customer service and professional expertise. Tarrant, Denton, Parker, Dallas, Wise counties. Residential and luxury real estate.